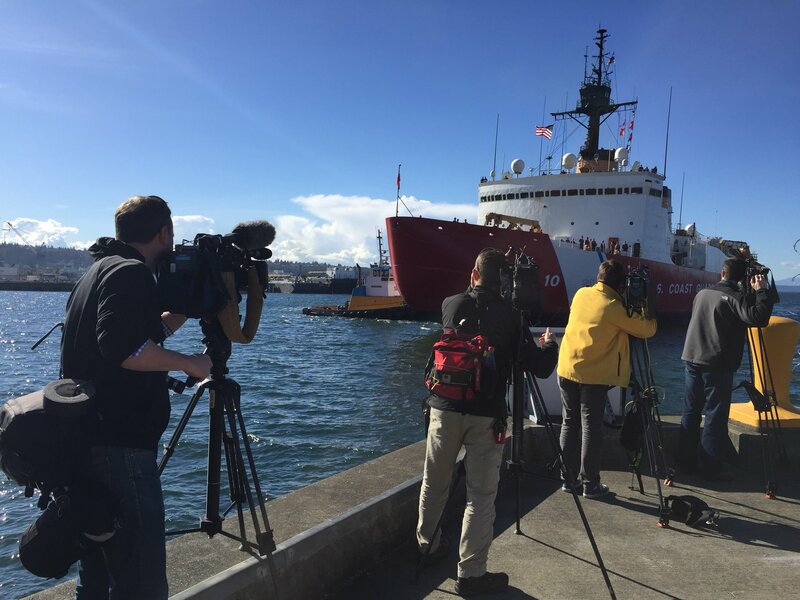 The U.S. Coast Guard’s only active heavy-duty icebreaker, the 42-year-old Polar Star, returned to its homeport in Seattle today to cap off a challenging months-long mission to Antarctica. The 13,000-ton cutter is built to break through ice as thick as 21 feet by backing and ramming, and can steam continuously through 6 feet of ice at a speed of 3 knots. Every year, the Polar Star voyages to the waters off Antarctica to keep shipping lanes open to McMurdo Station, on the southern tip of Ross Island. The ship left Seattle last November to take part in Operation Deep Freeze 2018, and faced numerous challenges — including two flooding incidents and the loss of one of the ship’s three main gas turbines. No injuries resulted, but the Coast Guard acknowledged that the problems took a toll on the crew and slowed the cutter’s progress to McMurdo. This entry was posted in GeekWire and tagged Antarctica, Coast Guard, Oceans, Polar Star, Science, Technology. Bookmark the permalink.